I know that the older I get, the more aches and pains I have. 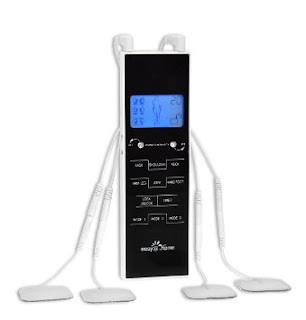 I've had shoulder and lower back troubles for quite a while and my Dr. has used a tens unit on me in his office and i gave me a lot of relief, so when I was given the opportunity to try out Easy@Home Deluxe TENS Unit Muscle Stimulator for at home use I jumped at the chance. It works by sending electrical stimulating impulses through your skin and into nerves and muscles. This stimulation helps to release your natural endorphines which block pain. This is something you should check with your medical provider to be sure it's safe for you to use, as well as any other treatment. It definately shouldn't be used by someone with a pace maker or someone who is pregnant. But this is safe for home use without a prescription as long as you don't have heart problems or some other serious health issues, like I said, check with your Dr. It has been a big relief for me with the pain I experience from time to time. This tens unit comes with the unit itself, 2 lead wires, 4 electrodes, and 4 batteries. Everything you need to massage and stimulate your way to relief of aching muscles and joint pain.